"Every time David Sturdy breads and fries up a homemade tenderloin for a customer he thinks of his son. After all, it is his son’s recipe he uses when he makes what he proudly boasts is the best tenderloin around." From an Ames Tribune article titled Little Shop Keeps up Memory of Fallen Marine. May 09, 2012 by Michael Crumb. Back in 2002 the family closed the Ice Cream Shop down and David's oldest son Brandon joined the Marines, fighting in Iraq and dying at the age of 19 in Falluja. 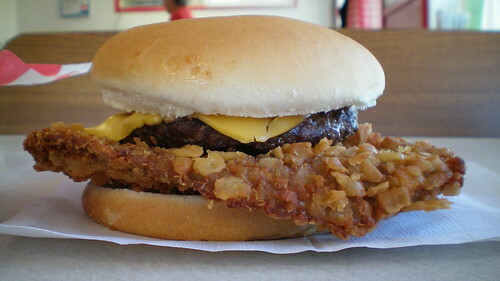 Cole's reopened in 2011, and the breaded tenderloin is a third of their food sales. That is some pretty heavy emotional stuff for a fried pork sandwich. Location: 101 E 6th Ave in Slater in Story County, Central Iowa. Directions: 6th Ave is Highway 210, the main drag through town between Madrid and Huxley. Its about 30 miles north of Des Moines. Important Note: I think this place closes down for the winter, if so then try again when spring rolls around. The Tenderloin: This was a thick slab of pork loin between the buns to make this sandwich. The seasoning was a bit on the heavy side with a good dose of salt and pepper in the breading. In the pictures you can see some salt added on top after cooking. The tenderizing didn't break apart the grain of the pork loin, so there is some soft chewiness to the thick cut. Served on a large untoasted bun with pickles and onion. Overall 8.4 out of ten. Also on the menu: Full ice cream menu with Picket Fence Ice Cream from Woodward. The food includes the usual burgers, hot dogs, and fried stuff. Service: It was just one guy running the whole show when I was there, not much to complain about. Ambiance: There is a small inside space but the outside is your regular small town ice cream place with a gravel parking lot and wooden picnic tables. There is a counter with a register inside and a walk-up window for ordering when its warm outside. Final Thoughts: The multiple hand painted signs reading GIANT TENDERLOIN beckoned me from the highway, and I was not disappointed by my stop from the road. Slater is close to the new bike trail and bridge over the lake that has been drawing a stream of visitors to the area. Next I will have to drive down Highway 210 to the Town & Country Cafe in Madrid and Lou's Diner in Woodward. This is the most definitive collection of tenderloin knowledge that exists. A veritable treasure trove of all things t-loin. Being from Cedar Rapids and living in Houston the past 30 years my tenderloin opportunities have been few and far between. In short, I miss and crave them. I'm very intrigued with the idea of bringing them to Houston. I definitely believe there would be a market for them.